Bernard Mahar was all in preflop holding [Ks][Kd] and was in great shape to double up against Jay Kovoor-Chathoth's [Kh][Qc]. As the flop fell [Tc][2h][Ac], Bernard said, "It's never easy," as Brad had picked up a gutshot to beat him. The [6c] turn gave Jay more outs to a flush, and the [8c] completed that flush. Bernard will exit this tournament in 5th place after that bad beat, earning $13,673 for his efforts. The board ran out a pure [Kc][2h][6s][7c][2s], and Sean will exit this tournament in 6th place. He will earn $10,432 for his efforts. 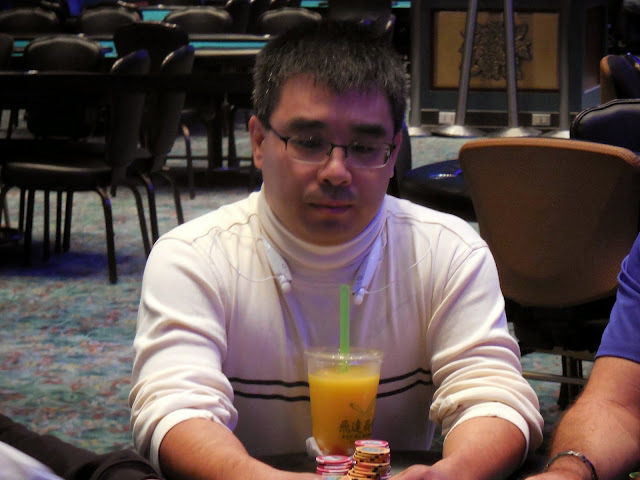 Carlo Sciannameo was all in preflop holding [Ad][8d] but had run into the [As][Ac] of Jay Kovoor-Chathoth. No miracles came on the [Kc][2h][3d][2c][Qc] board, and Carlo will exit this tournament in 7th place. He will earn $8,103 for his efforts. On a [Jd][9d][8d] flop, Dustin Denzik was all in holding [9c][8c] for bottom two pair against his opponent's [Jh][Td]. Even with the best hand, Dustin was only 35% to win as his opponent had so many outs. The [3c] turn made Dustin the favorite, but the [4d] river completed his opponent's flush. 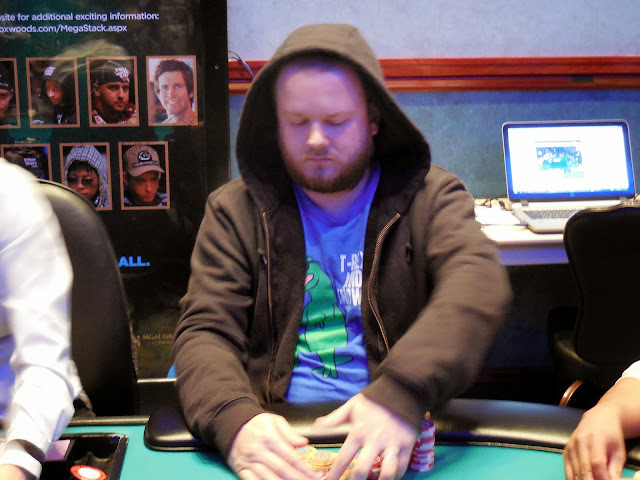 Dustin will exit this tournament in 9th place, good for $5,064. Bob Ricciuti was all in preflop holding [2s][2h] and was up against the [Ad][Kd] of Wayne Kaufmann. As the [7s][Kc][5d] flop hit, Bob got out of his chair. When the [Ac] hit the turn, Bob put his jacket on. 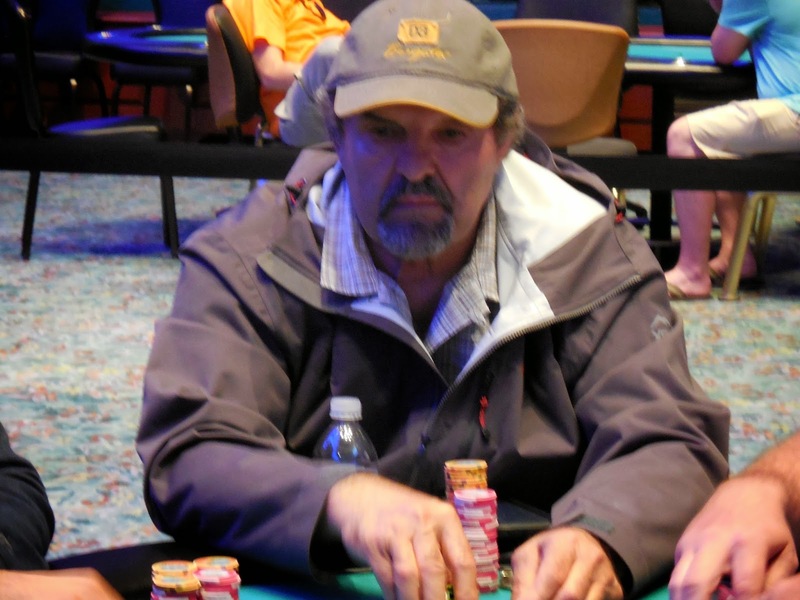 By the time the [4d] hit the river, Bob was at the payout desk to collect his $4,077 for his 10th place finish. Event #5 $580 NLH is now on break. When they return, blinds will be 6,000/12,000 with a 2,000 ante. Here are complete chip counts for the remaining field. We will try to fill in the missing names shortly. 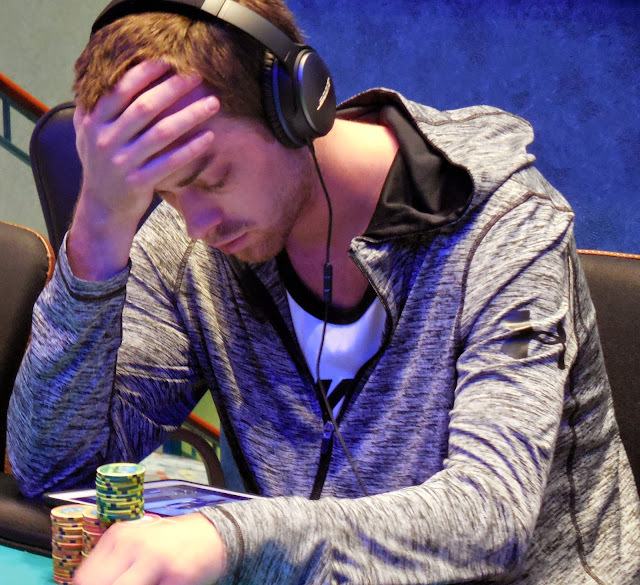 Event #6 $580 Six-Max NLH is on their one hour dinner break, and the field is down to 15 players remaining from a starting field of 91. 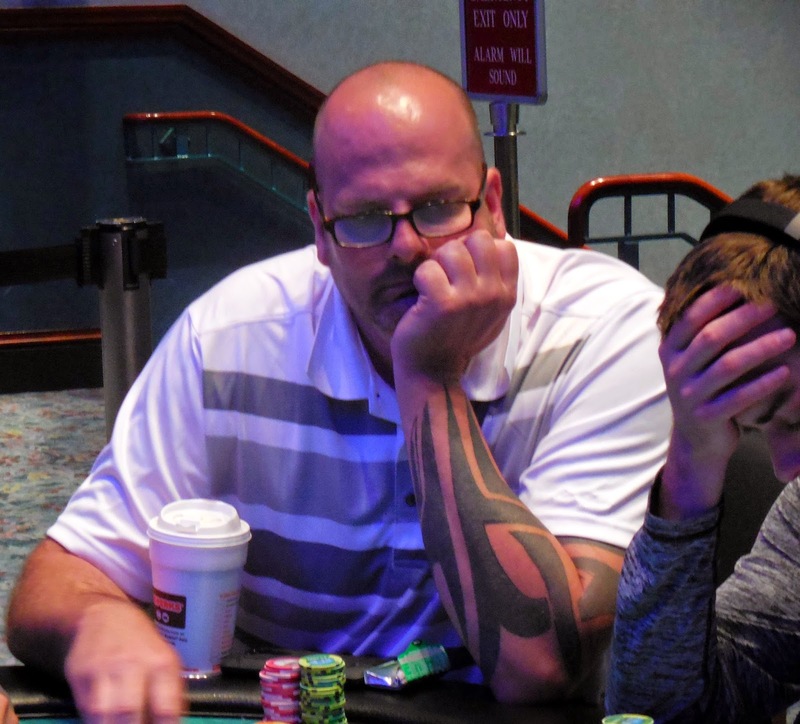 Ralph Macri is among the final 15, looking for his first WSOP-C cash. The top 12 players pay. The following players have been recently eliminated. The final 27 are now being redrawn into the final three tables. 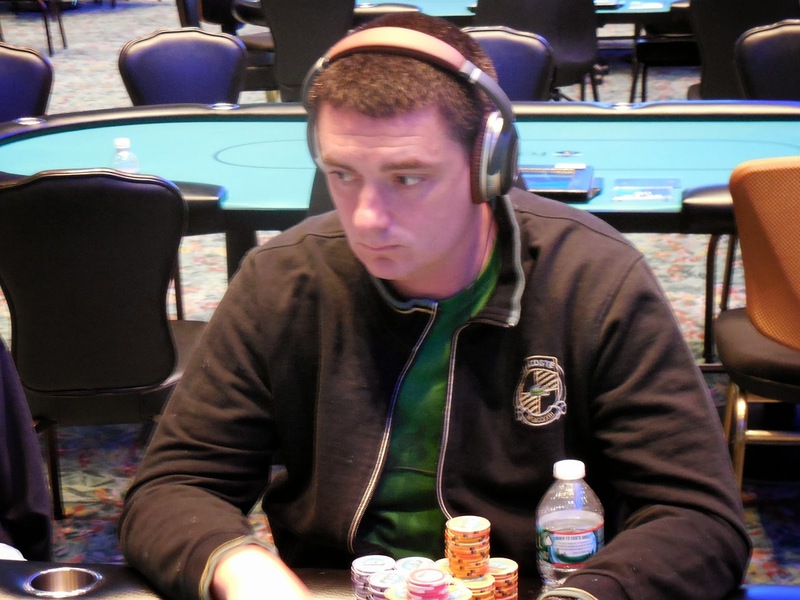 At 2,000/4,000 blinds with a 500 ante, James Campbell opened the hijack to 8,000. The small blind moved all in for 59,000 and James snap called after the big blind folded. It was a race as James held [Ac][Js] against the small blind's [6h][6d]. The flop brought some extra outs for James as it fell [8c][Td][Tc], and the [Qh] brought even more outs for James. The [Ks] hit the river to give James a runner-runner straight, eliminating his opponent. With that hand, the bubble has been burst, and the remaining 54 players are now in the money. They are all guaranteed a payday of $962. Event #5 $580 NLH is down to the final 55 players. The top 54 players will be in the money, so play is now hand for hand. The next player eliminated will be the bubble boy. We will attempt to bring you details on the bubble hand. Day 2 levels will be 40, 50 & 60 minutes. 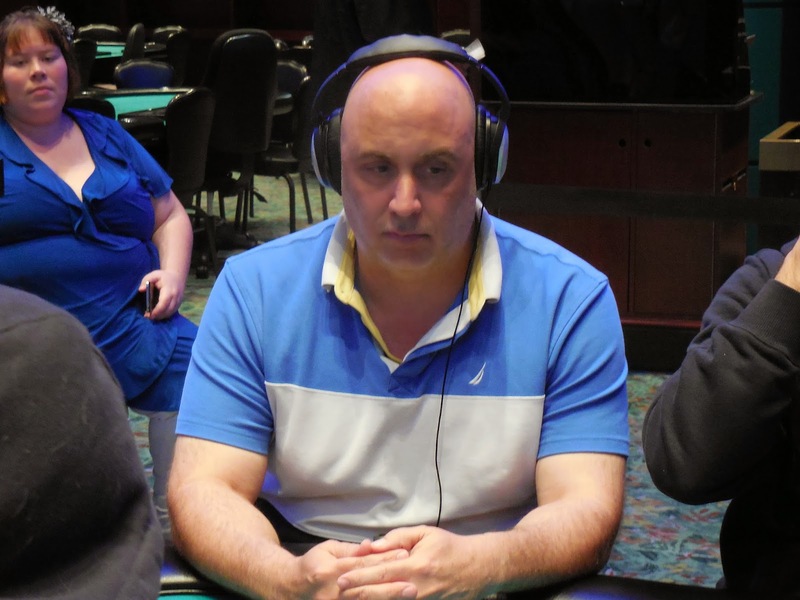 69 players remain, Bob Ricciuti leads with 231,000. Levels 16-21 will be 40 minutes, levels 22-25 will be 50 minutes, & remaining levels will be 60 minutes.There will be a 1 hour dinner break after Level 23 (approximately 8pm) . If needed a third day will be added. A full list of returning players with table and seating assignments will be posted shortly.